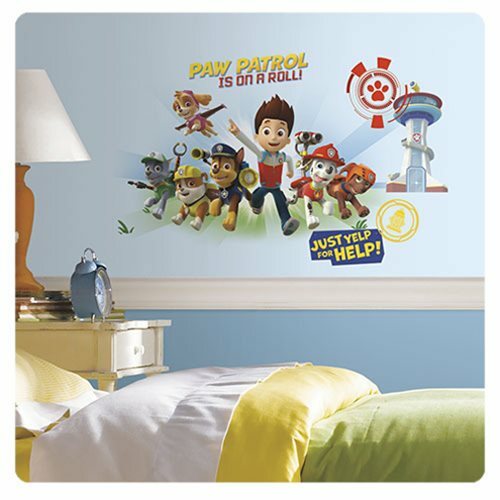 Help the Paw Patrol uphold the laws of Adventure Bay community with these Paw Patrol Peel and Stick Wall Graphics! Calling the Paw Patrol! Join these brave pups as they roll into exciting adventures shielding their community from danger. With a unique blend of problem solving skills to help get the job done, no situation is too hard to handle for the Paw Patrol. Featuring Ryder, Chase, Marshall, Rubble, Rocky, and Zuma, this wall graphic is the perfect addition to a preschooler's room! Decals range in size from 4-inches wide x 2 3/4-inches tall to 27 3/4-inches wide x 16 1/2-inches tall. Ages 13 and up.